"After a young friend shows up unexpectedly on her doorstep, Lady Mechanika immediately drops everything to come to her aid. 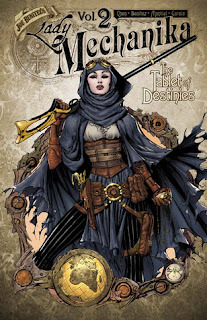 They embark on a globe-spanning trek filled with ancient artifacts, secret societies, and scientific curiosities, but Lady Mechanika is eventually confronted with an impossible decision: the life of her friend, or the fate of all humankind." You know how much I loved Lady Mechanika Vol. 1 and told you that I immediately started to read Lady Mechanika Vol. 2. I was excited about reading this since I loved the first one so much, but maybe that was the problem, I expected the second one to be just as good. The graphic was once again beautiful, I loved the gadgets and costumes as much as I did last time. Benitez, once again did a great job displaying Lady Mechanika and her allies, who were much more diverse than the last volume. Lady Mechanika shows a lot more of her sensitive side in this book, and while the book showcased her fighting skills there was not as much this time instead showing that our heroine can use her brains almost as well as her brawns. This was a point on the books behalf.